For good quality construction works, as constant supervision is required so is required good quality building materials. Thus, for good quality masonry works both “supervision” and quality bricks are required. We’ll discuss the requirements of good quality bricks in this post. In length they shouldn’t exceed 3mm and in width and height 1.5 mm. Shape should be uniform of quality bricks. Edges of them should be sharp, straight and right angle. Well brunt brick always have uniform color. That means, good quality bricks should have uniform color. Over burned and less burned bricks lost its uniformity of color on its surface and its strength. So, a good quality brick should have uniform color throughout. It can be red, cherry or copper-colored. Well burned bricks gives metallic ringing sound when struck with one another. Good quality brick surface should be free from cracks, flaws, air holes and any defect or impurities. Broken surface of good quality bricks should show uniform, compact and fine structure. Crushing strength of good quality bricks shouldn’t be less than 3.5 N/mm2. Crushing strength is tested in laboratory. We can also test its strength on field. Quality bricks left no mark when scratched with thumb-nail. In this way, we can guess its hardness. Good quality bricks shouldn’t break when dropped on ground from about two feet height on their flat face in a saturated condition. In this way we can be assured about its strength. 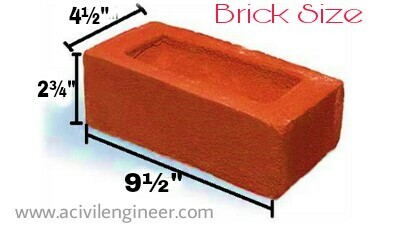 Good quality bricks doesn’t absorb water more than 20% of its dry weight when soaked 24 hours in cold fresh water. As we discussed beginning of this post, quality brick work doesn’t depend only good quality bricks. It also need proper supervision. You should read the “quality checklist for good brick works“.